The KID-ROW is only 6' long but a bundle of fun for the lighter and smaller kids. An ideal craft for swimming pool, pond, or similar protected water. Watch how fast they develop rowing skills, and in a project they can help build. Sanding edges and slapping on some paint can be done by even the youngest. Only a single sheet of plywood is required; inexpensive 1/8" luan "door skin" plywood was used on the prototype. With a full size pattern for every part in the boat, and using the Glen-L simplified Stitch and Glue method, building is quick and easy. Details are furnished for building your own oars and oarlocks from readily available materials. Make your favorite youngster the envy of their peers, and become their special favorite person... guaranteed! 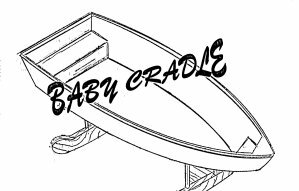 Receive a FREE set of "Baby Cradle" plans! 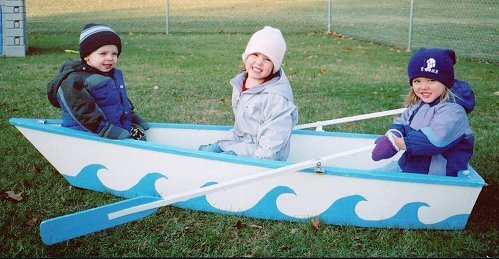 Use your Kid-Row as a cradle and when your child is grown, remove the rockers and complete it as a row boat for your child! Cradle plans will automatically be added to your Kid-Row Plans & Patterns purchase. Hull weight (approx.) 15 lbs. 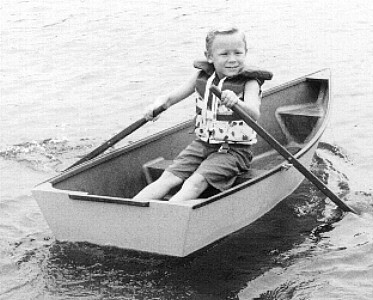 Hull type: Flat bottomed "kids" rowboat for Stitch and Glue sheet plywood construction. At a gross weight of 89 lbs. the hull will have 3" of draft. 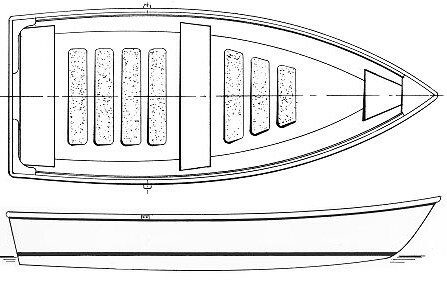 COMPLETE PLANS include FULL SIZE PATTERNS for the bottom, sides, transom, seats, seat uprights, knees, breasthook, floor strips, oars, and Plywood Layout, plus instructions, Bill of Materials, and Laminate Schedule.